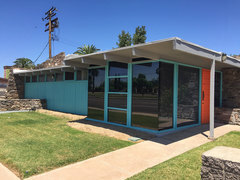 The Postwar Architecture Task Force has selected these Top 25 commercial properties from the Midcentury Marvels book for citizens to protect and encourage historic designation. 1963. 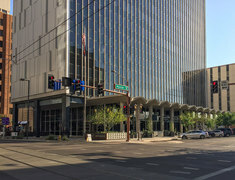 Constructed by real estate developer David H. Murdock to "provide the city with a piece of landmark architecture that had never before existed in Phoenix." 1974. 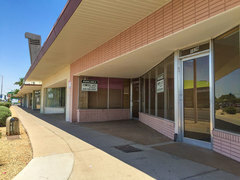 This unique vase-shape of this once bank branch was designed to be seen from the I-17. The new PUD rezoning will affect use of this land as it prepares to make way for light rail. 1957. 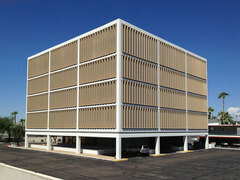 A masterful example of the Miesian approach to the International Style. 1959-62. Among the earliest post-war high rise office towers to be constructed along the Central Ave corridor. 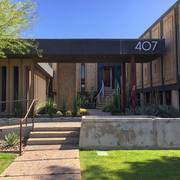 it was an attempt to create an environmentally responsive interpretation of New Formalism in Phoenix. 1947. A low key 'hide-out' purposefully designed to be unnoticeable, yet refined. 1954. A Southwestern twist to the Contemporary Style. 1963. 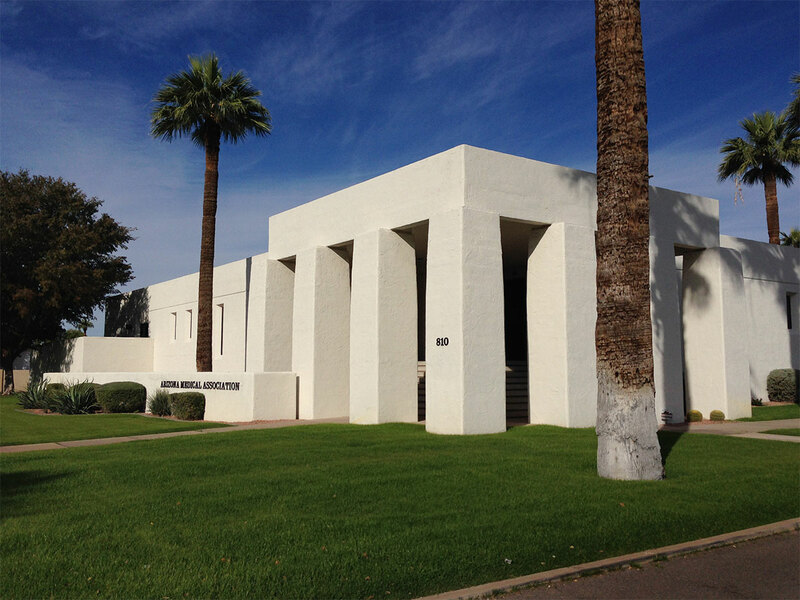 Studio of architects Lescher & Mahoney until Mahoney retired in 1974. 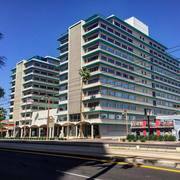 The building displays many different modernist principles. 1952. 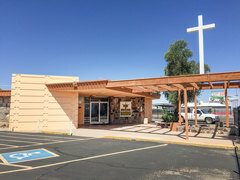 Influenced by Usonian house designs with a low-scaled horizontal roof plane and cantilevered overhangs as well as the use of native fieldstone. 1967. 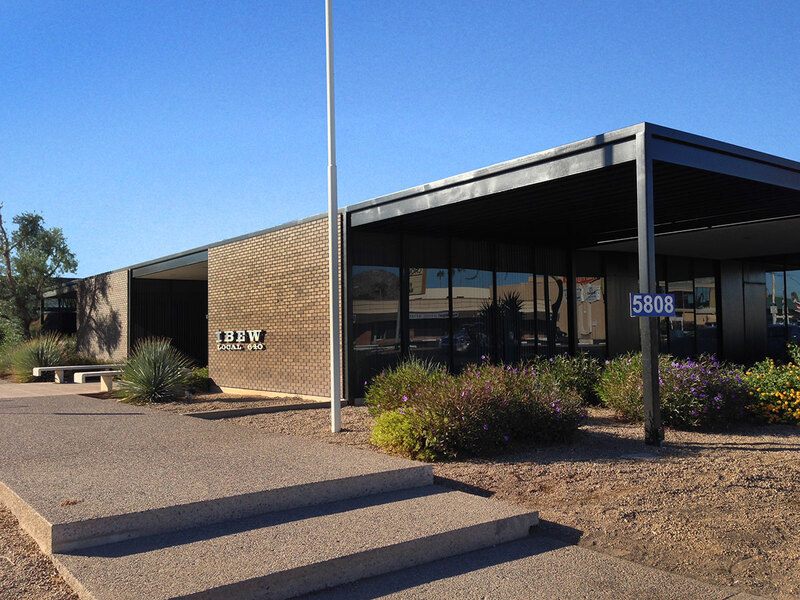 Beadle's interpretation of the Miesian International Style was the winner of the 1968 Central Arizona AIA's Award of Merit. 1962. 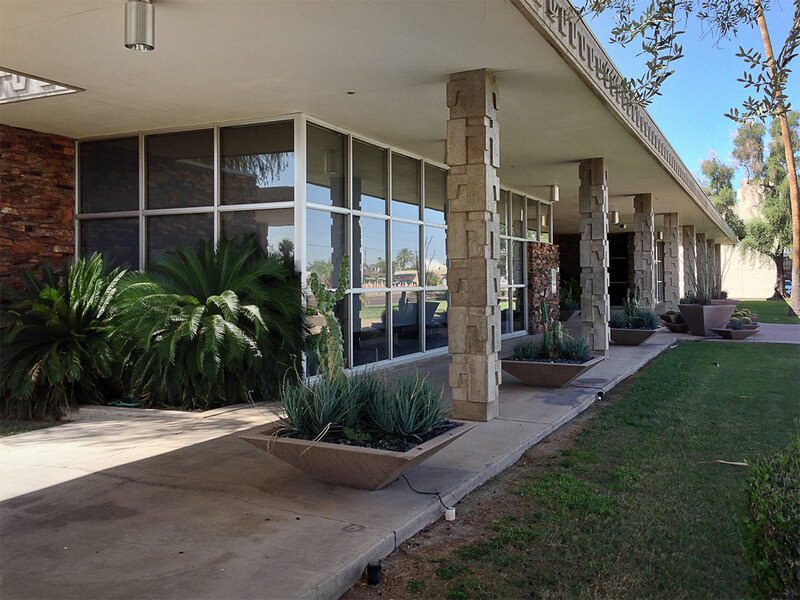 An organic modern stone and glass box with clerestory windows and a planter that extends from foyer to outdoors. 1963. 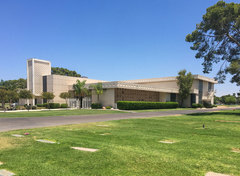 This sleek and stylish concrete and marble complex with shaded courtyards lets Phoenicians rest in style. 1964. A folded plate roof graces a Neoformalist colonnade in front of this glass box, the first in the metro area to use an interior structure to support an exterior facade. 1964. Once on the outskirts of a crowded downtown, these glassy storefronts tuck back at enticing angles under deep eaves to draw shoppers in. 1966. The distinctive concrete parasols uplift the old world brick into the new era of Modernism. 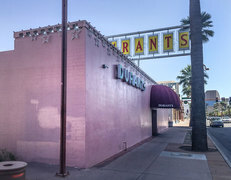 Has stood vacant for years and now favored by vagrants for shade. 1962. 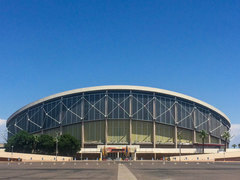 An elaborate concrete screen on a two-foot standoff shields massive glass curtain walls from the sun. 1957. 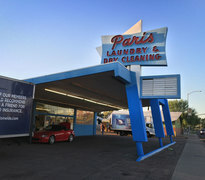 The jaunty porte-cochere and neon sign are holdouts of the googie era of advertising through the distinctive architecture. 1967. The ultimate Beadle box on stilts with narrow concrete slot windows and a gracious fountain entryway underneath. 1952. 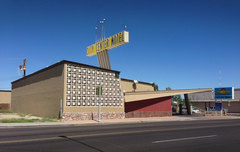 The enduring icon of a fifties hamburger stand, predating the first franchised Mc-Donald's in Phoenix by one year. 1959. 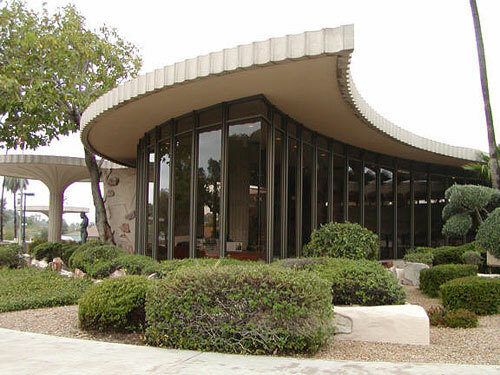 A soaring space-age porte-cochere sheltered guests when they arrived in central Phoenix along the former Funset Strip. 1970. 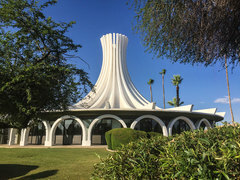 Massive regional modernist fortress designed by Bennie Gonzales FAIA. Currently vulnerable as it is for sale.